Inclusions: stainless steel fridge, stove, exhaust hood & built-in dishwasher, stackable washer/dryer, window coverings & electric light fixtures. Bright, open & airy design for comfortable living/entertaining space! Walls of windows in every room flood the suite with natural light all day long! Split floor plan with 2 refreshingly large bedrooms separated by the living area for optimal privacy. Extra-large balcony runs the full length of condo. Certain bbq's allowed. This is an oasis in the city - relax, rejuvenate and find your inspiration after a hard day's work. No elevator necessary! Conveniently located owned covered parking garage spot on the 3rd level - is an easy walk up. Ample visitor parking! Bike racks on same level as parking spot. Rec centre on same level as suite! Well run building with mostly owner occupied units. 24 hour concierge. Every 5 star amenity you could desire. Sellers particularly love the 2 guest suites available to rent per night, the running track and squash courts. Enjoy turnkey living and RARE all inclusive maintenance fees for easy budgeting! The future is bright -- exceptional investment to enjoy for years to come! Ideal for first time buyers/ professionals or investors! Super spacious, open concept living/diningroom finished in warm & neutral tones. Sliding glass doors lead out to the magnificent balcony. Open concept, extra spacious kitchen for a condo with stainless steel appliances provides plenty of cupboard space! Stylish steel multi-functional breakfast bar for casual meals and enjoying company of friends. Gracious master retreat! Large closet, broadloom and sliding doors walk-out to the balcony. Floor to ceiling windows, a double closet and broadloom throughout the 2nd bedroom. Large 4 piece semi-ensuite bath hasa separate laundry closet with stackable washer and dryer tucked behind closet doors. Lots of closet/storage space throughout. Highly respected development is part of the wave of the future that has transformed the west lakeshore area. 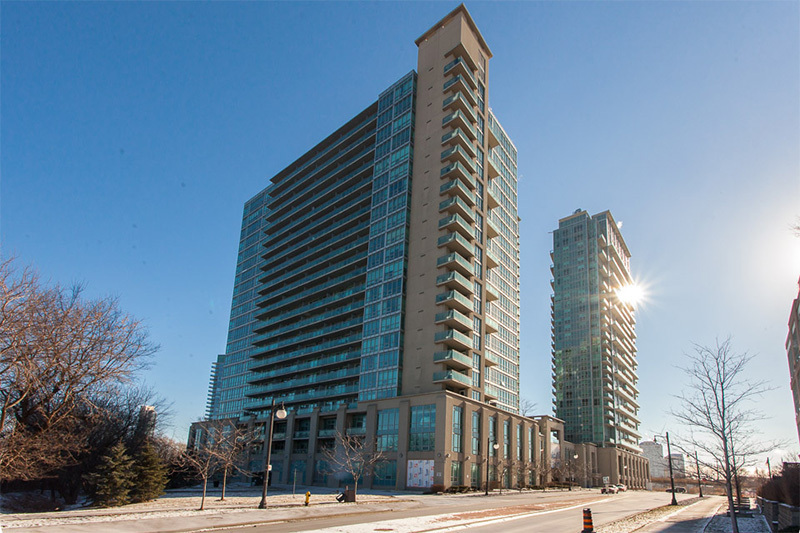 The Tides at Mystic Pointe is located near Lakeshore & Park Lawn, conveniently situated south of The Gardiner and Queensway! Proximity to desirable shopping districts including The Kingsway/Sunnylea, Bloor West Village & The Western Beaches! These shopping areas feature a variety of small locally owned stores and restaurants. Find big box stores along the Queensway. Foodies Rejoice! The Cheese Boutique, the one of a kind mecca of fine foods is minutes away. There is alot of development underway to accomodate the many new luxury condo buildings. For all of your shopping mall desires zip over to the renowned Sherway Gardens & Smart Centre just 10 minutes away featuring the finest of high end shops and stores! Plenty of parks & local recreation! Walk, run, blade or cycle along the popular Martin Goodman Trail right out your front door & join up with the 300 km Greenway Waterfront Trail for a nature hike around the Lake! Adjacent to the picturesque Humber Bay Park! Residents come out in droves to showtheir community spirit at a number of local events including the annual Mimico Tulip Festival in May, the Pumpkin Parade November 1st each year and the Etobicoke-Lakeshore Christmas Parade. Mimico Arena located off Royal York Road @ Drummond Street offers extensive hockey and skating programs in the winter & Lacrosse in the summer. Etobicoke's MasterCard Centre for hockey excellence including the Maple Leafs practice arena is located at 400 Kipling Avenue and offers a state of the art world class four ice-pad facility. Transportation is a snap! 5 minute walk to the 24 hour 501 Queen streetcar and the 145 downtown/Humber Bay express. Mimico has its own GO Transit train station located off Royal York Road, only a 15 minute walk away. Justa 15 minute commute to Union Station. Great school district! George R Gauld JS, John English Junior MA, Lakeshore Collegiate and many great catholic, private and alternative schools! Well run building by Brookfied Property Management with a healthy building budget and reserve . Responsive condo board and superintendent ! Very social building with friendly neighbours and many holiday parties throughout the year! Mostly owned suites. World class building amenities at the Bayside Sports & Entertainment Centre include: Welcoming entranceway with waterfall and reflecting pond, professionally landscaped gardens with courtyards and sundeck, barbecue patio with 2 gas BBQ's, full cardio theatre fitted with fitness equipment, aerobics and yoga studio, indoor whirlpool, outdoor swimming pool with whirlpool, 2 squash courts with viewing areas, His & Her change rooms, cedar saunas, party room with bar and lounge, billiards room with adjoining cards room, Hollywood style screening room with stadium seating, private dining room with catering kitchen, library, crafts room & 2 guest suites.